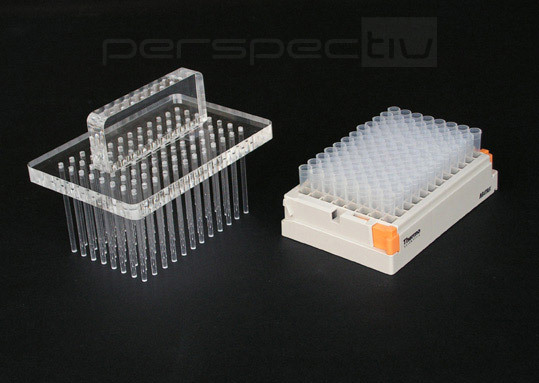 In the research and development process, the lab group works mainly with the so-called 96-well PCR plates (small plastic tubes arranged in a 12 x 8 matrix). In the first step of protein separation, a sample of plant tissue is placed into each of the 96 wells for DNA extraction. 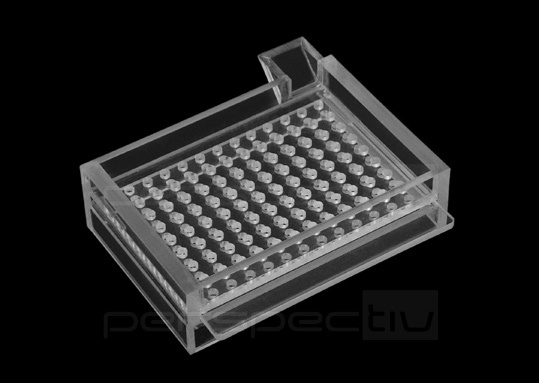 The samples need to be ground, and this can be done manually with our PMMA plate with 96 pins, manufactured specifically for this purpose. If the grinding is performed in a mill grinding machine, a single metal or glass bead, usually 2 to 4 millimeters in diameter, is dropped into each well by hand, an activity that is prone to error: more than one bead can be accidentally dropped into a well, or a well can be skipped entirely. Most of these errors cannot be detected because the wells are deep and their contents are dense, and it is difficult to see the bottom. 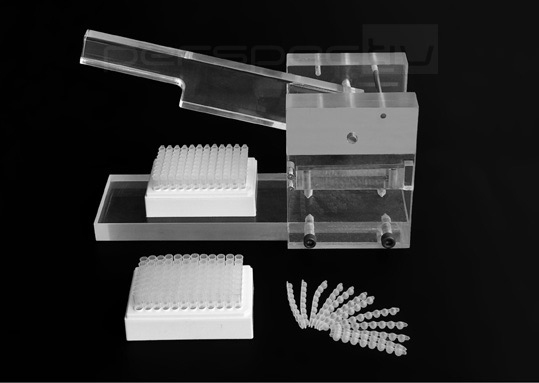 To avoid such mistakes and replace the manual process, which can take several minutes, we have developed a simple and effective product that allows rapid and accurate dispensing of the beads. The customer need only specify the type of bead and the type of 96-well plate used. Using the dipenser: A large number of beads are spread across the surface of the dispenser, which is then shaken until one bead can be seen in each hole. To discard the excess beads, simply tilt the dispenser. Next the dispenser is placed over the 96-well PCR plate. One press on the front of the dispenser and each well receives one bead, the entire process taking less than a minute. We manufacture dispensers for steel, tungsten and glass beads of any desired diameter. Dispensers that drop two beads in one press are also available. Once the beads are in, the wells are sealed with 12 PCR-cap strips (8 caps per strip). The device is then placed in the grinding-mill machine. The machine shakes the 96-well PCR plate with high-frequency vibrations. During this process, the caps are under high pressure, and they therefore must be hermetically sealed so that no fluid will leak out. The wells are usually capped manually. A pressure of 2 kg must be applied to each well to close it properly, amounting to 200 kg of pressure per 96-well plate, effected through the workers' fingertips. In laboratories that carry out many DNA extractions, this capping activity is physically exhausting and highly time-consuming. To simplify the process, we have developed a special press. The PCR cap strips are laid over each lane of wells, the plate is placed in the press, and the device's cover is pressed down once over the wells - which are now hermetically sealed. This entire process takes less than a minute. The device is easily adjusted to cap all types of plates. Using this device, the wells can also be sealed with a cap mat in a few seconds. Once ground, the DNA samples need to be colored with a fluorescent dye before loading onto an electrophoretic gel, so that they can be detected under ultraviolet light in the gel after electrophoresis. To do this, a sheet of Parafilm is laid over a flat PCR Tube Rack; 96 small cavities are formed by manually pressing the parafilm into the rack holes. The DNA sample is dripped into the cavities and colored by adding the fluorescent dye. It takes a few minuts to create these cavities by hand. To shorten the process, we have created a silicone plate with 96 convex domes. This silicone plate is placed over the Parafilm and with one press, you have 96 small cavities. The silicone is soft enough to avoid damaging the thin Parafilm when it is pressing it into the holes. Once the DNA dyeing process is complete, the DNA samples can be applied to the appropriate electrophoretic system.